Surfing is a sport that attracts individuals who are into extremes. As the waves are generated by the swells, winds and many other factors – the perfect time for surfing is often rather limited. 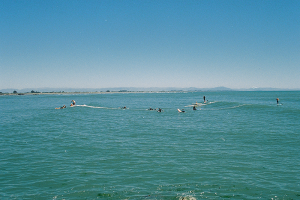 On a perfect day – when the waves are good, many dedicated surfers are eager to go for a surf, and often find themselves surrounded by a group of other surfers. Yes, surfing with friends is fun, but when there are a lot of people on the same spot, the break gets crowded. Surfing is a sport for individuals, not for teams. Also the conception of “common sense” is widely misunderstood by both beginner and experienced surfers. Best way to respect the surfing culture is by following the worldwide rules in surfing, other words the surf etiquette. A term that has a rather negative background. Localism means is when a certain group of “Local” surfers has established their own rules, where “foreign” surfers are not that welcomed. Localism happens when the locals are breaking the overall surfing rules – in order to push off non-local surfers from the line-up. Every culture has certain rules they follow, that have accumulated over the years. So is with surfing, which has a clear code of conduct to follow. Violation of unwritten gentleman’s rule. Do not paddle through the surfable area where one could surf the wave. 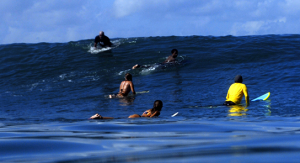 Always paddle back to the line-up so you would not disturb anyone planning to catch the wave. The most dangerous aspect of surfing is when there’s a loose board on the surf. A surfboard can knock anyone unconscious, which is the worst scenario that could happen when surfing. Bailing, other words letting go of your surfboard when duck diving or surfing the wave not only injure fellow surfers – but also damages surfboards, that are very easily dinged. The most known and important rule in surfing. The person closest to the peak has the right of way to surf the wave. Note: When the peak breaks both ways (A-frame wave) two surfers can ride the same wave but in a different direction. It’s best to yell out which way you are going to let the fellow surfer know of your plans. When somebody has already caught a wave or stands closer to the peak to catch it – do not drop in and start riding the wave after they already started. It is the most common mistake beginners and kook’s do. In case you dropped in on someone’s wave – make your priority to exit the wave as safe and smooth as possible. Snaking is an act when a surfer is moving around in the lineup like a snake, trying to get a better position. By doing that, the “snake” is. Sneaky behind other’s back in order to get closer to the peak and surf the wave. Say sorry or correct your mistakes immediately.